Chief guest of the event was Mr. Sushil Gupta, Principal Director, Process and Product Development Center, MSME, Meerut. The session got started with the introductory speech of Neha Vashistha, she explained the basic agenda and motive of the workshop. Dr Neha Yajurvedi and Neha Vashistha were the key speakers. Dr Neha Yajurvedi had explained students about the importance of case study in business education, types of case studies, its advantages and benefits. Dr Ashok Gupta, Dean, School of Business Studies, gave realistic examples of cases from business world to the students. He portrayed many cases like BAJAJ, Surf etc. Neha Vahistha, explained in her lecture about what are various tools that are used in solving case study. What types of analysis are used when to find out various alternatives in solving a case study. She also provide two case studies to students so that they can able to understand how to solve it and able to enhance their skills of decision making. In key note address by Mr. Sunil Gupta, he motivated students to become entrepreneur and detailed about various types of risks associated and how to overcome from those risks. He shared his experience about business and job. He said that a person should always remain a student and there should always be a zeal to do something new and innovative to succeed. Dr. Jayanad, Registrar, Shobhit University, presented his views about case studies, that in an organization there are many events and activities happens which may cause success or failure. Every activity bring some experience from which we have to learn. At the end of the workshop, memento had been presented to chief guest Mr. Sunil Gupta by the dice members. 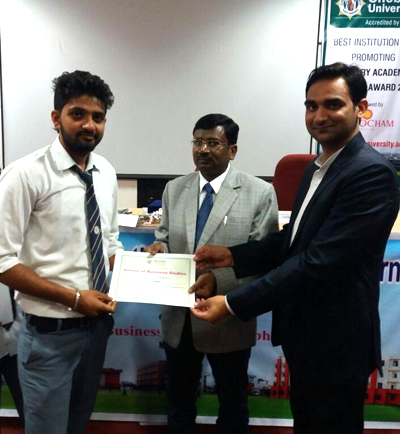 Certificates were distributed by Dr Jayanad, Dr Ashok Gupta and Mr Sunil Gupta to the students.